On October 2017, the Royal Australian Navy issued a Technical Directive to replace traditional cleaning chemicals used on board the LHDs HMAS Canberra and HMAS Adelaide with Envirofluid’s range of environmentally-friendly products. The directive was issued in response to increased pH levels and associated foaming in the treated effluent from their equipment which were suspected to be caused by chemical input from upstream cleaners that enter the waste streams. The LHDs, built by Navantia in collaboration with BAE Systems, are equipped with high-tech Detegasa membrane bioreactor sewage treatment plants or STP. This type of STP processes sewage load through growth of organic microorganisms that feed on the organic matter. The effluent is then filtered through a series of membranes which results in high-quality, treated effluent that is safe to be discharged in waterways. The Royal Australian Navy concluded that the different cleaning and maintenance chemical products from various manufacturers, which were previously used on board the LHDs, were ultimately entering the black and grey water systems, adversely affecting them. By issuing the cleaning chemical substitution directive, the Royal Australian Navy effectively eliminated hazardous chemicals that, until that time, entered the waste water streams and negatively affected the efficiency of the membrane bioreactor STP. In addition, the use of limited compatible products from a single manufacturer prevents any downstream problems. Using non-toxic, eco-friendly cleaning agents also ensures the health and well-being of the LHDs personnel and the environment. These benefits are further supplemented by reduced inventory and the removal of other unnecessary hazardous substances, as well as reduced sustainment costs by sourcing codified products. The Royal Australian Navy employed a Systems Engineering approach to the evaluation of chemicals, ascertaining compatibility with bacteria growth and the biological process, ensuring a neutral impact on pH levels, and reducing foaming within the STP. Envirofluid was selected for their available product range, which were evaluated and determined to be less hazardous to personnel, the environment, and the system than the previously used chemicals. Envirofluid is the Australian leader in providing effective, safer substitutes for a wide range of industrial, cleaning, and maintenance chemical products. The company has 15 years’ worth of experience seeking out the best science has to offer in order to find responsible, high performance replacements for some of the most commonly used toxic and dangerous chemicals that place people at risk of instant injury or long-term harm. Now that the TM181 has been fully implemented HMAS Adelaide and HMAS Canberra have eliminated their on-board issues, reduced chemical inventory items by over 80% and improved safety compliance and environmental outcomes. 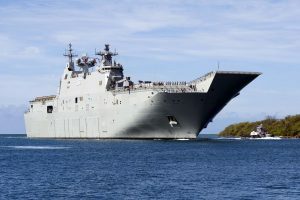 Image of HMAS Canberra from Wikimedia Commons.